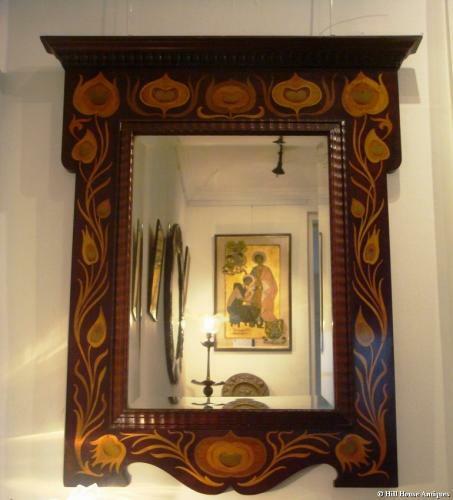 Truly stunning and rare, inlaid mahogany framed Arts & Crafts/Art Nouveau mirror by Shapland & Petter of Barnstaple, Devon. In our opinion, one of their best, most striking and strong designs. Shaped overall rectangular frame with ripple moulding to mirror plate border, all beautifully surrounded by inlaid stylised peacock feathers. This type of inlay was usually reserved for their finer items. With superb provenance as well; c1900. NB - in the first image there is a vaseline light shade encroaching on bottom left of mirror - nothing missing!